"1300s BC" redirects here. For the decade, see 1300s BC (decade). 1397 BC: Pandion I, legendary King of Athens, dies after a reign of 40 years and is succeeded by his son Erechtheus II of Athens. 1390 BC: In Mesopotamia, emergence of the Assyrians as an independent power. 1385 BC: Pharaoh Amenhotep III of Egypt marries Tiy, his Chief Queen. 1380 BC: Amenhotep III connects the Nile and the Red Sea with a canal. 1357 BC: Danish Egtvedpigen is buried. 1347 BC: King Erechtheus II is reportedly killed by lightning after a reign of 50 years and is succeeded by his younger brother Cecrops II. 1346 BC: Pharaoh Amenhotep IV of Egypt begins his Cult of Aten and begins construction of Amarna intended to be his new capital. 1345 BC: Amenhotep IV renames himself Akhenaten. 1336 BC: Akhenaten names Smenkhkare as a co-ruler. c. 1334 BC: Tutankhaten becomes Pharaoh of Egypt and marries Ankhesenpaaten, daughter and wife of his predecessor Akhenaton. 1331 BC: Tutankhaten renames himself to Tutankhamun and abandons Amarna, returning the capital to Thebes. 1320 BC: Egypt: End of Eighteenth Dynasty, start of Nineteenth Dynasty. c. 1310 BC: The Bhagavad Gita is written, according to some Hindu traditions. 1309–1300 BC: Cecrops II, King of Athens, dies after a reign of 40 years and is succeeded by his son Pandion II. Pandion II was later driven into exile from Athens by the sons of Cecrops II's brother (or possibly nephew) Metion, so that Metion could take power. Pandion II fled to Megara, where he married the King's daughter and eventually inherited the throne. After his death, Pandion II's sons returned to Athens and drove out the sons of Metion. 1307 BC: Adad-nirari I becomes king of Assyria. 1300 BC: The legendary King Pan Geng moved the capital of Shang Dynasty to Yin. c. 1300 BC: Rise of the Urnfield culture. 1398 BC—Birth of Tiy to Egyptian nobleman Yuya and his wife Tjuyu. She later becomes the Chief Queen of Pharaoh Amenhotep III of Egypt and the matriarch of the Amarna family. (approximate date). 1391 BC—Pharaoh Amenhotep III started to rule. 1368 BC—Death of Erichthonius, mythical King of Dardania. 1366 BC—Birth of Princess Tadukhipa to Tusratta, King of Mitanni and his Queen Juni. She will be later married to Amenhotep III and after his death to his son and heir Amenhotep IV Akhenaton. She is variously identified with Akhenaton's Queens Nefertiti and Kiya. 1365 BC—Ashur-uballit I rises to the throne of Assyria. 1362 BC—Birth of the later Pharaoh Amenhotep IV Akhenaton to Amenhotep III and his Queen Tiy. 1350 BC—Pharaoh Amenhotep IV Akhenaton rises to the throne of Egypt. 1341 BC/1340 BC—Birth of Tutankhaten, later Pharaoh of Egypt as Tutankhamun (approximate date). 1338 BC—Queen Tiy of Egypt, Chief Queen of Amenhotep III and matriarch of the Amarna family, vanishes from the historical record. Presumed death. 1337 BC—Queen Nefertiti of Egypt vanishes from the historical record. Presumed death. 1334 BC/1333 BC—Death of Smenkhkare, Pharaoh of Egypt and co-ruler with Akhenaton. 1334 BC/1333 BC—Death of Akhenaton, Pharaoh of Egypt. 1323 BC—Death of Pharaoh Tutankhamun of Egypt. 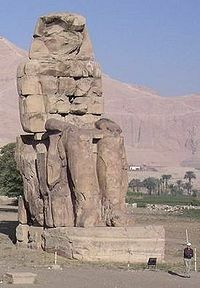 1320 BC—Birth of later Pharaoh Ramses II of Egypt (approximate date). 1300s BC—Seti I of Egypt. 1300s BC—Pan Geng of China. Suppiluliuma I, king of the Hittites. See: List of sovereign states in the 14th century BC.